Constant Hygiene Limited provides the complete range of washroom services with a total commitment to exceptional service. Our experienced staff will listen and advise to ensure that you receive the correct washroom solution, ensuring that you comply with current legislation and your Duty of Care to everyone using your facilities. 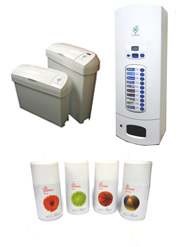 We are totally committed to the products we recommend as we realise they will be a reflection of your hygiene standards. All products are vigorously monitored to ensure they are the best for each application and situation. We know that our service record is exemplary and take great pride in maintaining this very high standard. SERVICE IS THE CORNERSTONE OF THIS COMPANY and we never forget that this is what our customers are paying for and deserve. Considering all the above points we can guarantee that we offer a superior service at a fair price and that is what our customers expect and receive.